Hey....this is my 500th post! Cool hey? 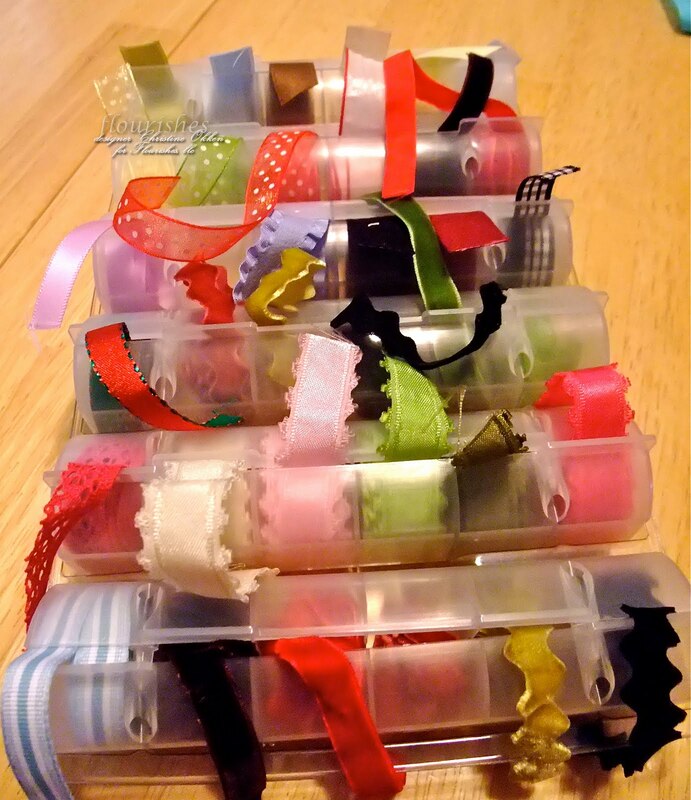 If you're anything like me....ribbon storage is an issue for you. One thing that I absolutely LOVE about Flourishes is that I can get beautiful ribbon at a fraction of the price by purchasing it by the yard. 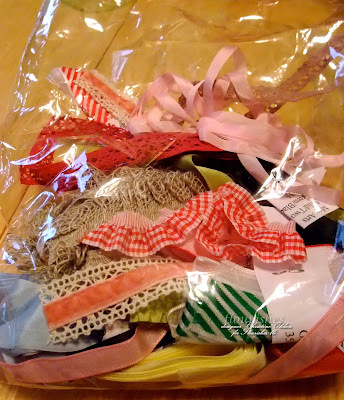 That way I only buy what I'll use, and then I can get more ribbons to sample! But...then to store ribbon by the yard was becoming a serious issue for me. When ribbon arrives for me from the store it usually looks like this, delicious ribbon, but not super functional and a little messy to store like this. So, this is one of the nifty tools I bought - the Ribbon Spooler and also the Organizer tray that I'll show you in a jiffy. 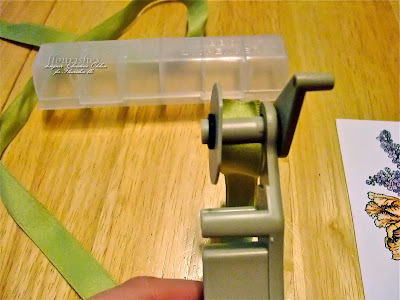 Here's how it works... feed your ribbon through the slit in the ribbon spooler (up to 7/8 inch wide ribbon), put on a provided divider disk and rubber stopper to hold the ribbon in, and then take the length of ribbon and feed it up along the handle (next photo). Then just push the little ribbon off either onto the divider tool, or just in your hand holding the end. 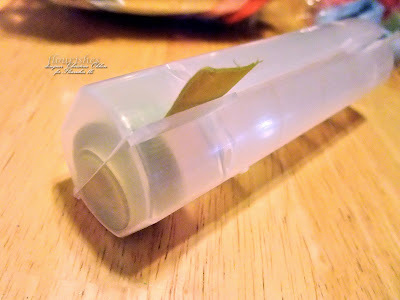 Then, the great part, pop it into the little divided holder, leaving the loose end out so you can pull it to cut when you need it! Here's a whole LOVELY row of Satin Finish cotton and Linen cotton ribbons. 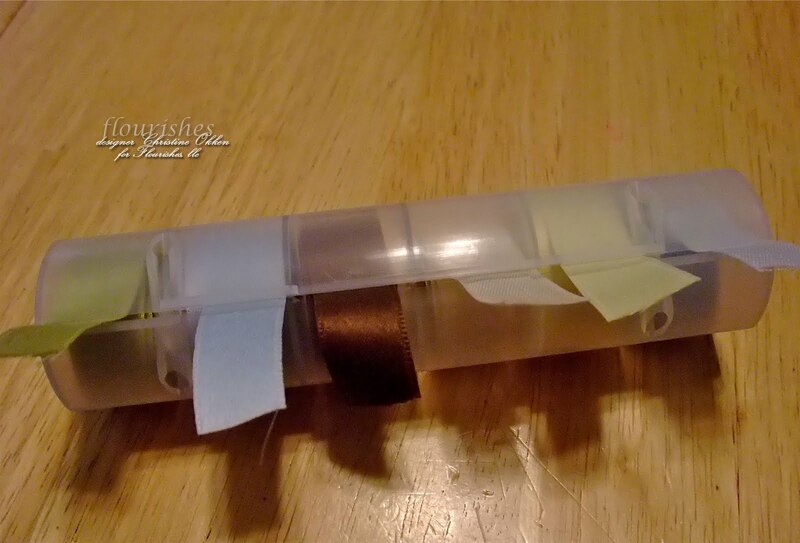 It holds six rows of six ribbons. I'm just waiting for a new tray to arrive so I can load it up too. 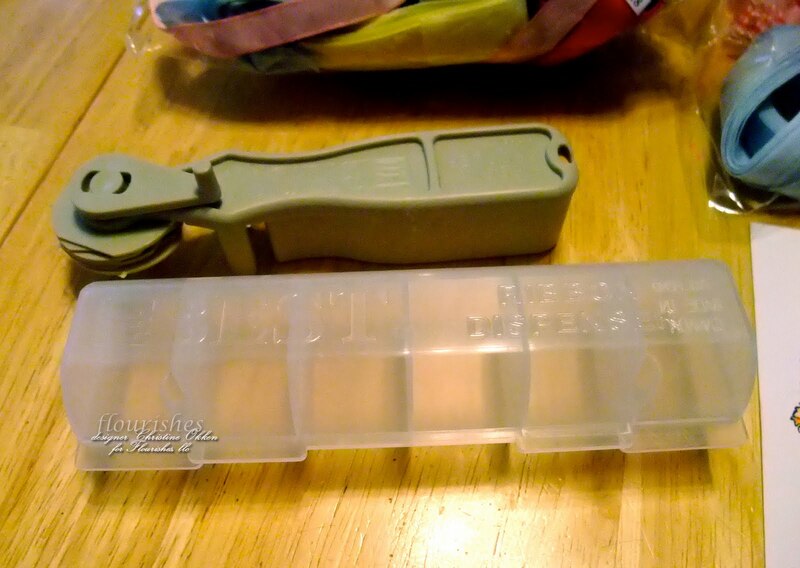 It stacks nicely in my stamping cupboard, and it's easy to pull out. The only con is that it only takes ribbon up to 7/8 inch, and I have ribbon that is wider that I have to organize differently. If it took wider ribbon widths, I'd do this to all my ribbons. I can see what I have, or what I need and it's easy to pull out and cut. 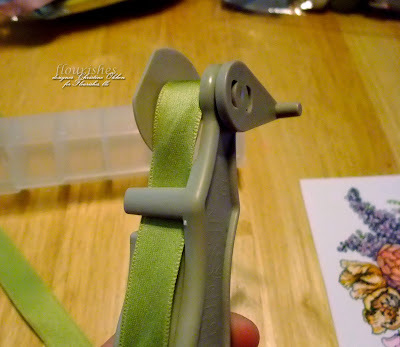 So, here's what I made with my ribbons and also a great new product to Flourishes, Scor Tape. I've been using it a long time. It's really superior for sticky-ness and sturdy-ness and comes in a variety of widths (3 sizes in store). I was SO excited to see it in the store!!! I cut a box 6 1/2 x 6 1/2 out of textured Pink Pirouette paper and then a bottom 6 1/4 x 6 1/4 inches. 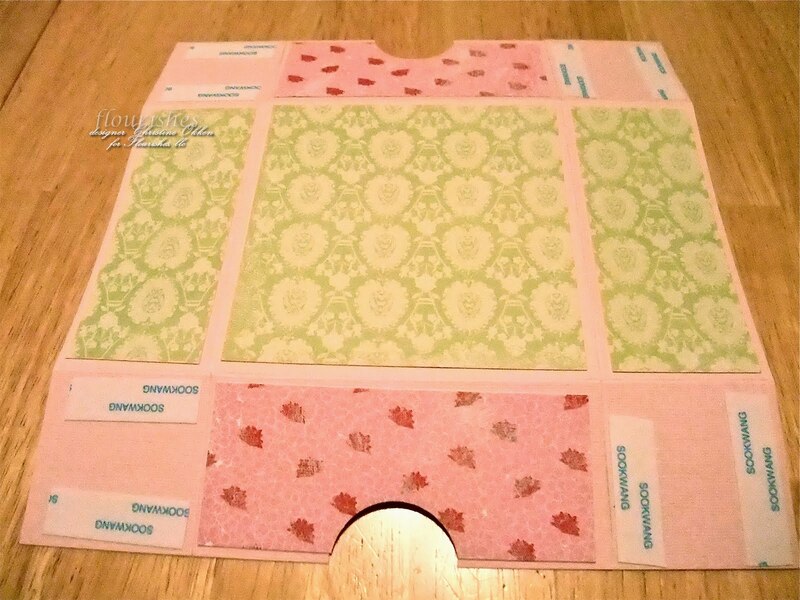 I scored at 2 inches all the way around (both sheets), cut slits on opposing ends on the inside of the short squares (to make the pieces you fold in to make the box), and added Scor Tape to the fold in squares, and patterned paper (Memory Box Jubilee) to the outside panels on the box lid. I notched out little 1/2 circles with my circle punch. Then fold in. 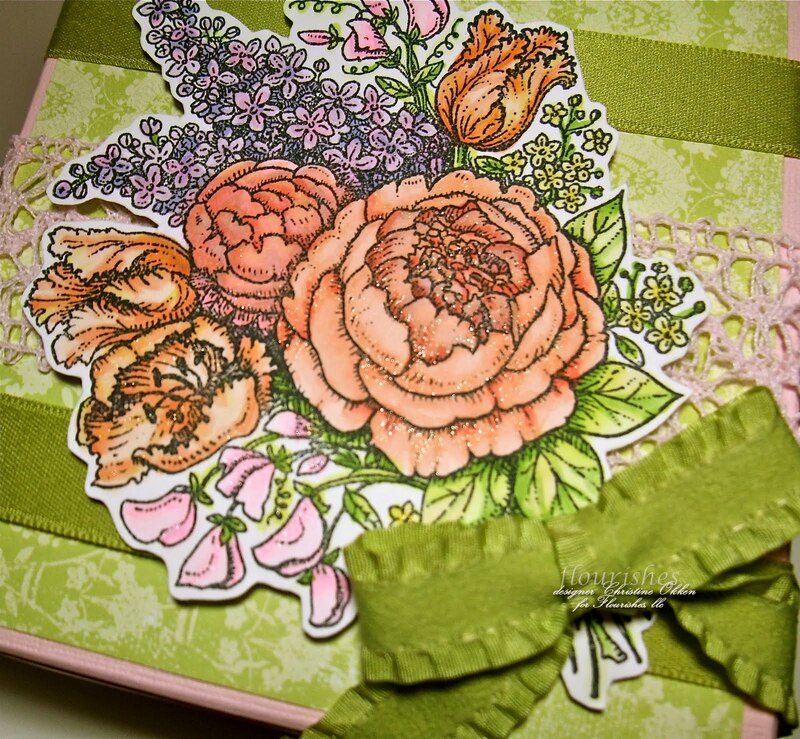 I had colored up an image from our gorgeous Spring Bouquet Set with copic markers, and then trimmed it out and added it to the box top, overtop of some beautiful ribbon. I used the Scor Tape all around the box and added ribbon as well, some pleated (which stays GREAT with Scor Tape), and then some just adhered. Here's a closeup of the coloring and the beautiful glitter that I added with Spica pens after coloring. I know the photo won't do it justice, it's super shimmery. Now to find a pretty present for IN the box and we're set! That box is so beautiful. It doesn't need a gift to go inside. IT can be the gift itself! And look at all your organized ribbon! Such a beautiful box. And a great way to keep ribbon "under control". 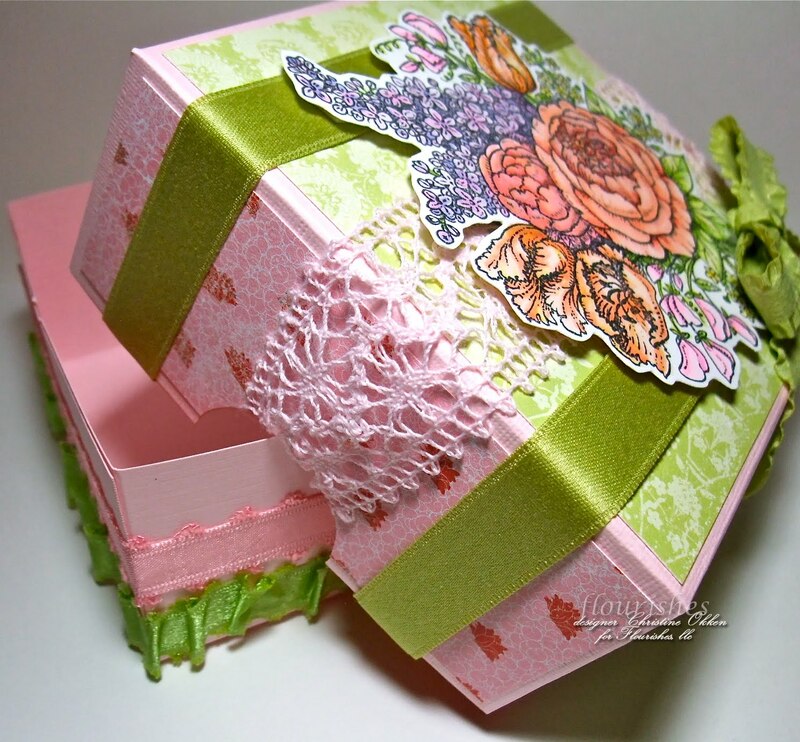 Oh WOW your box is BEAUTIFUL and that ribbon organizer is FABULOUS..TFS! Thank you so much for showing that box - I am always on the lookout for ways to make boxes - yours is just gorgeous! Well, Christine, how cool is that ribbon organizer....you should see my ribbon organization...yikes!!! I'll have to order some of those wonderful little containers!! I love your box, too...sooo pretty and vintage!!! Love the colors you used and your coloring and details are over the top!!! Hope all is well with you and your's!!! Wow... beautiful box Miss Christine! 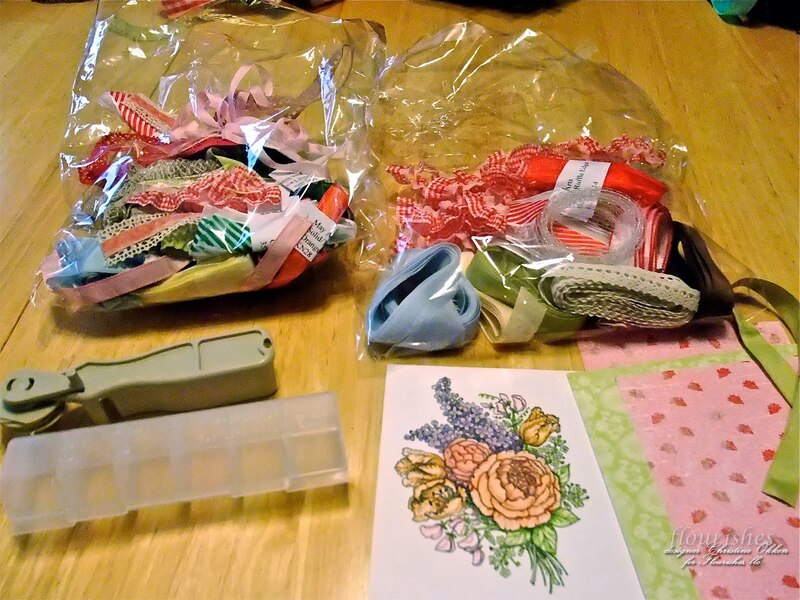 Love the papers and ribbons you matched up and of course, your coloring is... magnificent! Thanks too for the ribbon organization inspiration! Gorgeous little box! Love the paper...it works so beautiuflly with that stamp! 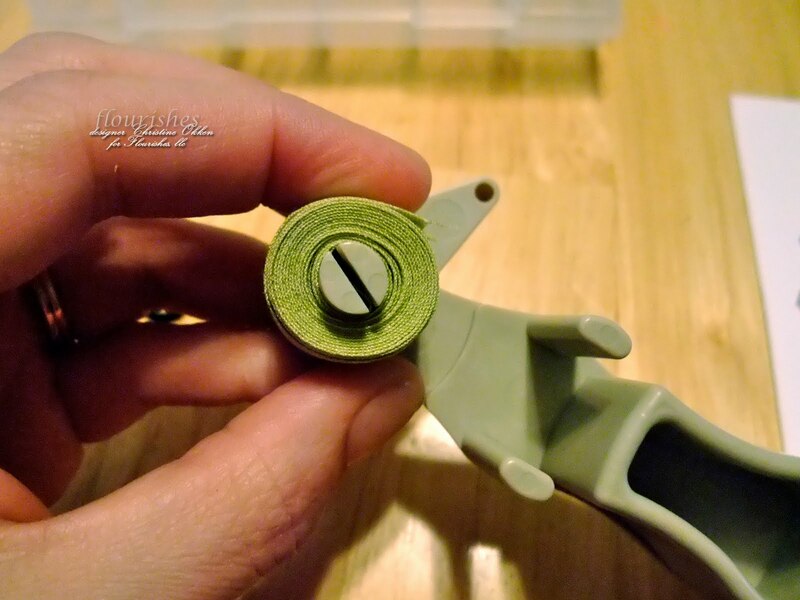 Awesome tutorial on the ribbon spooler! Oh my goodness! This is to die for! So beautiful. Well, I think the ribbon spooler is pretty darn cool! 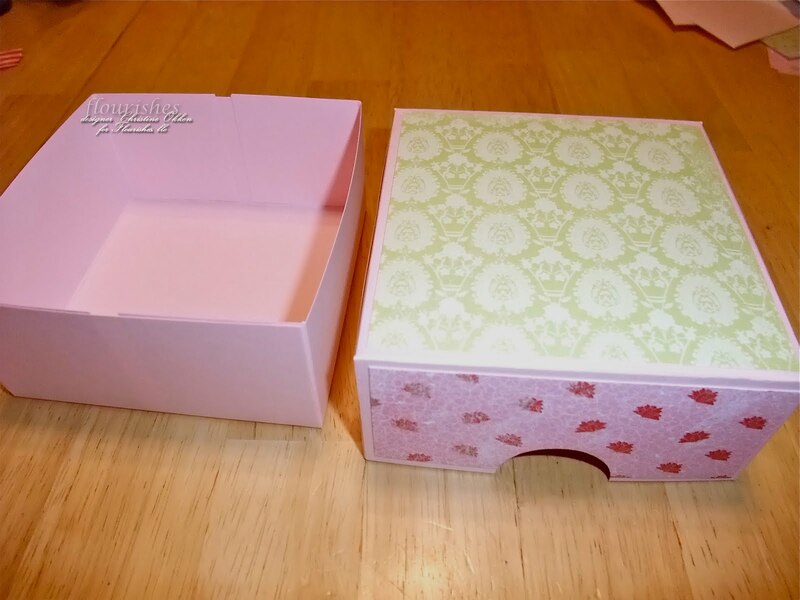 Your box is ultra-feminine and pretty! I love how you added the ribbon to take up space. 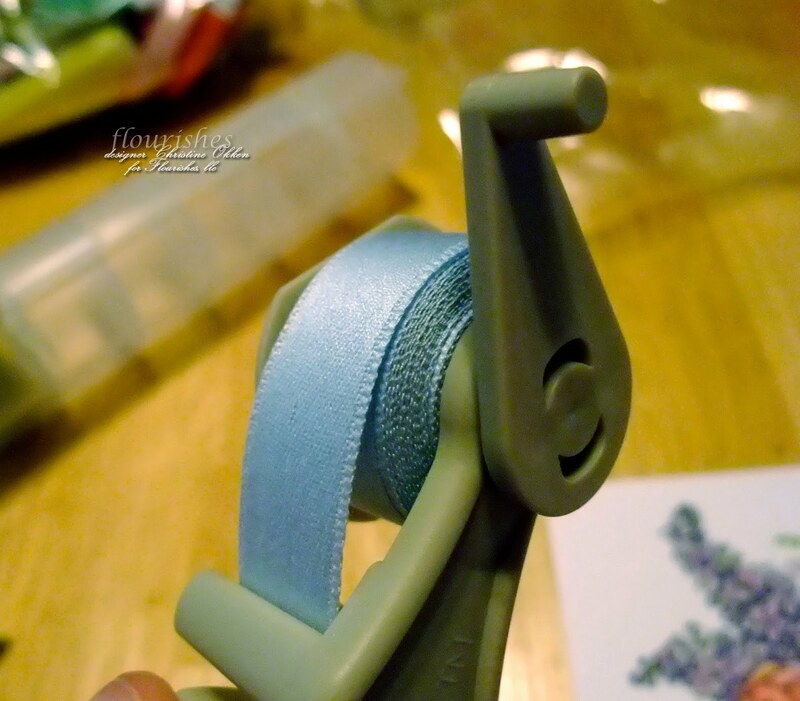 What a great idea, and one can never have too much ribbon, right? Thanks for sharing all this great info, Christine! This is a great tutorial.. Love the box too.. You did a super job on this one..
Oh, how pretty! I loved that flower set when I first saw it, now seeing it colored, I guess I will have to buy it! Thanks for the great tool tips, very helpful! That ribbon spooler is definitely a cool tool and your box is amazing! Beautifully colored and that May Arts crochet lace is one of my F-A-V-O-R-I-T-E-S!! Love the beautiful box you've made. That is so pretty!! 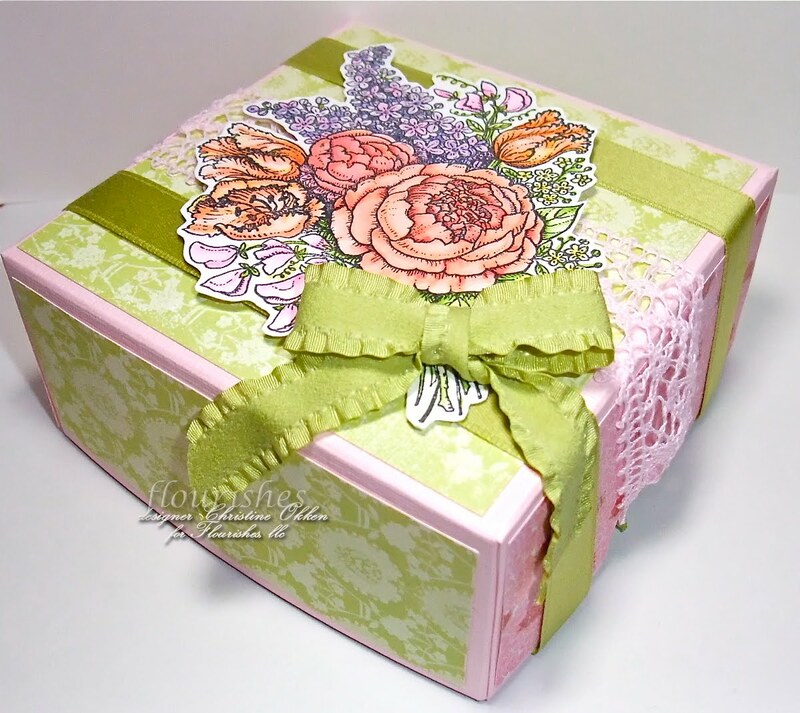 Gorgeous box Christine! Your coloring and sparkles on the bouquet are so pretty!! The ribbon organization is great! I tried to be organized once...ha! Wow! This box is GORGEOUS!! I love the lace. Your ribbon looks great all nice and neat. Want to come do mine now? LOL The box is beautiful!